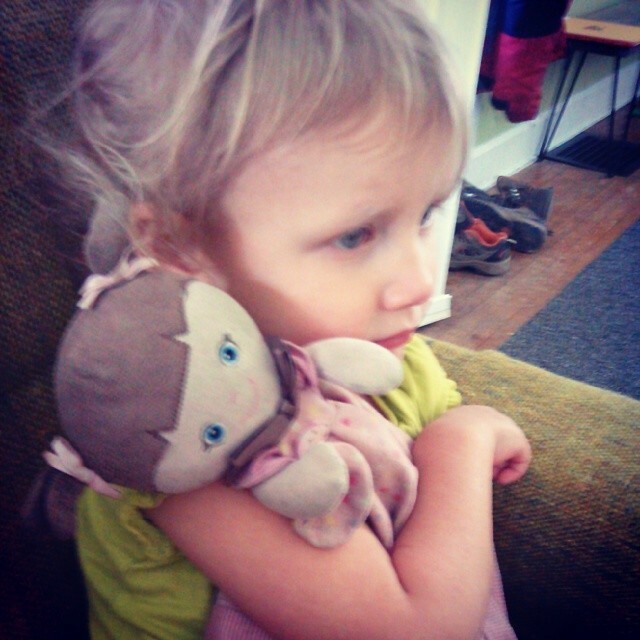 My almost-3-year-old daughter, Margot, has a dolly/blankie that has been her Favorite Thing since she was old enough to have a favorite thing. In fact, she recently told me that Dolly is “her sister.” So you see, they are quite close. Margot and Dolly (well . . .) want constantly to be together. Yet, Margot and Dolly can never be together, or when they are, they are not really together so much as in this tiny moment of grace between their frequent separations. Perhaps these are not even moments of grace and togetherness but some kind of willful defiance of what seems like a magnetism-grade repulsion between their two beings. Margot is constantly unhappy–Dolly is always gone. But, Margot can’t live without Dolly–in fact, what she does seem to live for is that moment we finally spy Dolly stuffed between couch cushions, or under a kitchen towel (where Margot has placed her but forgotten), or hiding behind a door. Margot screams with joy– “Dolly!! !” Something in the constant wresting apart of the two parties makes the reunion that much more exhilarating–and that much more addictive.
. . . perhaps. Perhaps all of this. Perhaps none of it. Perhaps I am making something from children and their toys. Or perhaps there is an idea worth pondering, a question worth asking in this uncensored, unapologetic act of a child–what is in my life by my defiance of incompatibility, of magnetic repulsion, or of my addiction to overcoming the seemly-fated separation between me and it? Reading this was like feeling a gentle wind rustling old memories:) and I really liked how you made it applicable to yourself.